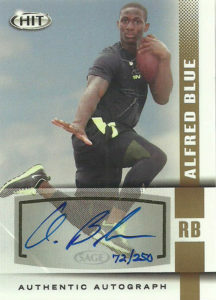 Alfred Blue has always been an interesting diamond in the rough. 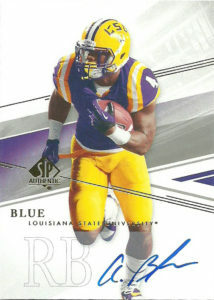 Originally a 6th round pick out of LSU, Blue compiled 209 carries for 1253 yards and 11 TDs over his college career. Primarily coming in off the bench and oft-injured, Alfred only technically made 7 starts for the Tigers. While he’d probably be considered the #1 back at many other schools, it really tanked his draft stock as LSU keeps a solid stable of backs. Coaches also felt that Alfred was weak in pass protection and overall physicality. It was surprising to see Blue drop so far into the 2014 NFL Draft, but the Texans were fine picking him up there in the 6th round. Houston was rebuilding its runningback depth chart. With Arian Foster oft-injured and Ben Tate realizing his dream of being a #1 back in Cleveland, the Texans needed to revitalize the position. Blue has been an O’Brien favorite since claiming a spot on the Texans roster. He rushed for 528 yards and 2 TDs in his rookie season. 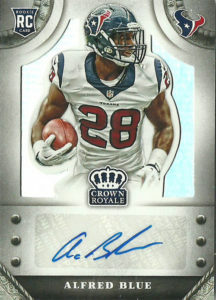 In 2015, Blue helped the Texans reach the playoffs stepping in for Foster for 9 games, rushing for 698 yards on 183 carries and 2 TDs. He ran a career high 31 times for 139 yards and a TD against the Buccaneers in a 19-9 win during week 3. 2016 saw the arrival of free agent Lamar Miller for the Texans, essentially replacing Arian Foster as the lead dog. Blue would become more of a change of pace back to Miller, and while Alfred was more efficient, his carries dropped. It appeared that 2017 was the year that Alfred was going to be on the way out, as the Texans drafted Doak Award Winner D’Onta Foreman in the 3rd round. Foreman impressed and climbed the depth chart, but tore his Achilles ending his season. Blue stepped in near the end of the season and chipped in 108 yards on 16 carries in a loss to the Steelers. He finished the year with 262 yards on 71 carries and a TD. He also had 7 catches for 54 yards. Houston didn’t really do anything with their RB depth for the 2018 season. Blue found no suitors in the open FA market worth signing with and re-upped with the Texans. A valued special teams contributor, Alfred will find competition this season from Tyler Ervin, but it remains to be seen what will happen before opening day. I had tried to get Blue during his rookie season on a card or two as well as a great photo of him diving over a pile to score a TD but disappointingly he didn’t respond. Eventually I gave up and during the low point of the season in 2016 and 2017 I bought a few of his cards.